A couple weeks ago we set up our feeders in preparation for the winter birds. With new feeders it’s good to have them up early because it always takes a little while for the local birds to find them, and the migrant birds will hone in on all the activity. 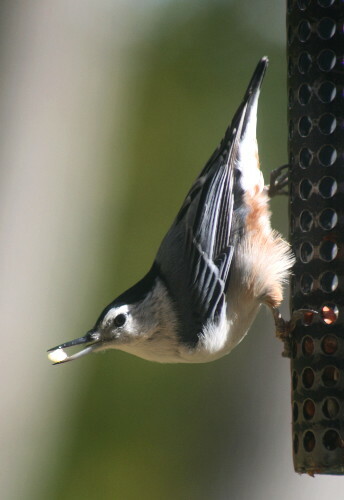 The chickadees were the first to discover the feeders, followed by the goldfinches, but the White-breasted Nuthatches weren’t far behind. The only other species we have coming at the moment is Blue Jays. I have a suet feeder up for the woodpeckers, but so far we’ve had none at all to any of the feeders, suet or otherwise. The Hairy that was hanging around here for a while seems to have disappeared. We have a platform feeder that Blackburnian built, which is scattered with mixed seed, and a silo/house feeder filled with black oil sunflower. The suet feeder is a wooden block with 1″ diameter holes drilled through it, which you insert pre-made suet “logs” into. My mom had one of these up at her place last winter, and the woodpeckers absolutely loooooved it. As an added plus, the feeder is assembled by mentally challenged people and supports them. I recently bought a nyger feeder but haven’t hung it yet. The final one we have is this peanut feeder. This is another popular one, visited by woodpeckers, nuthatches and chickadees – all those species with good stout bills. The peanuts, most of them, are too big to fall out on their own, but the birds are able to peck the nuts and break them into pieces that they can then remove. Even though there are some peanuts in that mixed seed, this nuthatch seems to prefer the challenge of working them out of the holes in the feeder. I hadn’t heard about the peanut feeder (as opposed to setting them on the platform) . I bet that foils the squirrels quite handily, does it? We make our own peanut butter suet and stuff it into a homemade log with holes in it. The girls love to eat the food while we’re stuffing it into the log – it’s made them much more interested in watching the birds that come to eat the food that ‘we’ make.